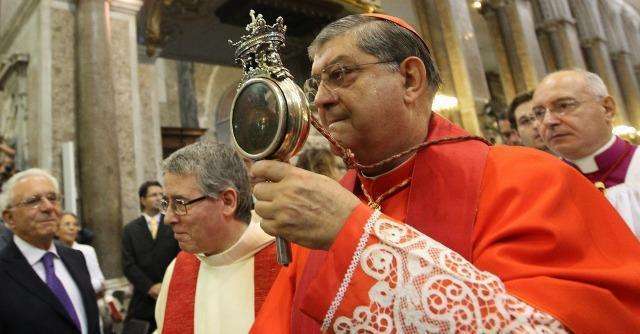 Naples, Italy, Sep 19, 2018 / 12:01 pm (CNA/EWTN News).- Cardinal Crescenzio Sepe of Naples usually does not faint at the sight of blood. He has celebrated the miracle of the liquefaction of the blood of St. Januarius, an early martyr, many times over the years. But this year, something caused Sepe to “blanch” and sit down during the Sept. 19 celebration of the miracle, Italian news agency ANSA reported. While he refused to leave the altar, Sepe felt too faint to carry the phials of blood outside to show the crowds who had gathered in anticipation of the miracle, which typically occurs three times a year. The blood did liquefy during the celebration, according to ANSA. St. Januarius, or San Gennaro in Italian, is patron of Naples was a bishop of the city in the third century, whose bones and blood are preserved in the cathedral as relics. He is believed to have been martyred during Diocletian persecution. The reputed miracle is locally known and accepted, though has not been the subject of official Church recognition. The liquefaction reportedly happens at least three times a year: Sept. 19, the saint’s feast day, the Saturday before the first Sunday of May, and Dec. 16, the anniversary of the 1631 eruption of Mount Vesuvius. During the miracle, the dried, red-colored mass confined to one side of the reliquary becomes blood that covers the entire glass. In local lore, the failure of the blood to liquefy signals war, famine, disease or other disaster. The blood did not liquefy in December 2016, but Monsignor Vincenzo De Gregorio, abbot of the Chapel of the Treasure of San Gennaro, said it was a sign that Catholics should pray rather than worry about what the lack of miracle could mean. “We must not think of disasters and calamities. We are men of faith and we must pray,” he said at the time. The vial has sometimes changed upon the visit of a pope. On March 21, 2015, Pope Francis met with priests, religious and seminarians at the cathedral and gave a blessing with the relic. Sepe then received the vial back from the pope and noted that the blood had partially liquefied. The last time blood liquefied in the presence of a pope was in 1848 when Bl. Pius IX visited. The phenomenon didn’t happen when St. John Paul II visited the city in October 1979, or when Benedict XVI visited in October 2007.